In a bathtub-sized kiln at the back of her art studio, Jerri Bartholomew stacks layers of glass, one on top of each other like an oversized deck of cards. She closes the lid, flips a switch and waits for the temperature to climb. When the glass begins to glow red-hot, it melts and fuses into a single object, becoming a translucent collage of form and pattern. Layers of meaning also concern Bartholomew in her day job, head of the microbiology department and the John L. Fryer Aquatic Animal Health Laboratory at Oregon State University. She and her research team pursue clues about cause and effect — how a parasite kills fish, how a pulse of river water changes the risk of infection, how a worm no bigger than an eyelash forms a vital link in a deadly cycle. “In some ways, science is stripping away the layers to see what’s beneath,” says Bartholomew, “and art is the opposite, building up the layers to create something new.” Both draw from the same creative impulse, a desire to ask questions, to experiment and to learn from trial and error. In a collaboration with The Arts Center in Corvallis, Bartholomew is bringing her two worlds together, culminating in April in a show — Microbiomes: To see the unseen. The scientist and her colleagues have hosted artists in their lab to explore life forms as diverse as they are micro. 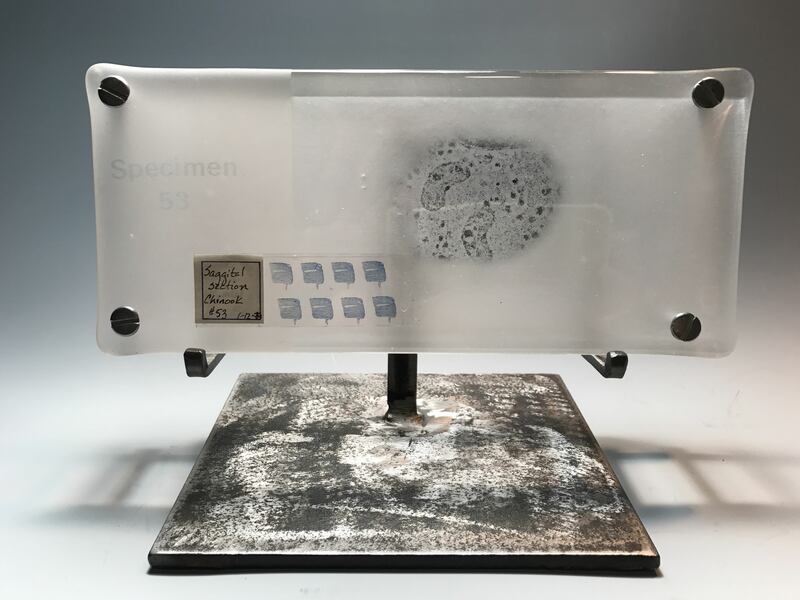 Researchers shared their knowledge and curiosity about bacteria and their kin, which morph from one shape to another, communicate through chemical signals, invade other organisms and disperse like dust through air, water and soil. In turn, the artists conducted their own observations by collecting microbes from surfaces — a door knob, a slice of bread, a pet’s hair, their own skin — and seeing what would grow on standard agar plates. They reflected on how microorganisms cheat or steal from each other and how some seem to communicate like gossips at a picnic. Bartholomew and her colleagues have spent their careers asking their own questions of the microbiome. In particular, they have focused on a parasite that is extraordinarily lethal to fish and goes by the name Ceratonova shasta — C. shasta for short. If that’s not memorable enough, the illness it causes might be: gut-rot disease. The scientists have asked how this creature does its dirty work. Where did it come from? Who are its relations? How is it influenced by climate, hydrology and the animals that serve as repository or host? First discovered in a fish hatchery near Mount Shasta in 1948, gut rot (aka enteronecrosis) has been found in fish in many Oregon rivers: the Columbia, Willamette, Cowlitz, Clackamas, Deschutes and Rogue. However, the Klamath is ground zero. Here, the parasite thrives in sluggish channels on warm summer days, causing severe and ongoing losses in juvenile Chinook salmon. When Bartholomew came to Oregon State as a graduate student in 1981, scientists had been stumped about just how C. shasta lived. They knew the organism is a member of a clever group of parasites known as Myxozoans, which kill fish with a variety of illnesses: whirling disease, PKD (proliferative kidney disease) and even one called hamburger gill disease. These microbes are about the size of a blood cell and invisible to the naked eye. In rivers around the world, evidence of their presence accumulates as dead fish pile up in eddies and along shorelines. Last summer, in an effort to control the spread of a PKD infection in mountain white fish, more than 200 miles of the Yellowstone River in Montana were closed to recreation for about six weeks. Another Myxozoan parasite deforms fish and causes them to swim in a corkscrew fashion — a condition known as whirling disease. This microbe, a European immigrant, has spread to much of the Northeast and the West, decimating trout in some streams. Even more puzzling was another mystery. Fish would be infected in some parts of the river but not others. Through a series of trial-and-error experiments, it took Bartholomew, Fryer and their colleagues 16 years to identify a tiny worm that comprises a critical part of the disease process. When an infected fish dies, C. shasta spores (a kind of microbial seed) pour out of the carcass and into the water like rats off a sinking ship. As the microorganisms float downstream, they pass mats of worms living on the streambed. 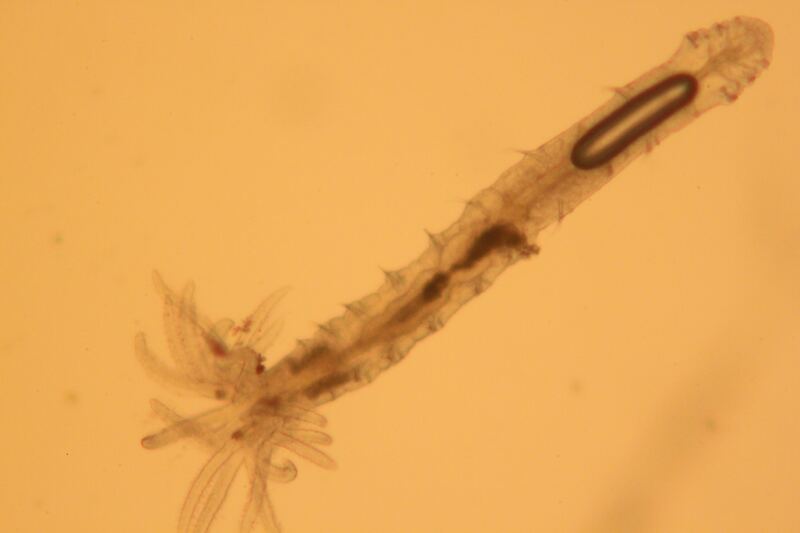 About the size of an eyelash, these worms feed indiscriminately by gathering particles from the water. Once ingested by the worm, C. shasta does something remarkable: It fires two filaments into the wall of the worm’s feeding tube. Once the filaments penetrate the wall, C. shasta opens up, and out crawls an amoeba that shimmies its way into the body of the worm. The life cycle of Certonova shasta, known previously as Ceratomyxa shasta, is shown in this illustration from the Bartholomew lab at Oregon State. As these C. shasta spores drift aimlessly in the current, they wait for a fish to pass. When a salmon or trout comes close enough, through a signal that is still not understood, the parasite again fires its filaments and, like a pirate boarding party, climbs aboard through the gills. Thus begins the final leg of this complicated journey. C. shasta navigates through the host’s blood, following a path forged long ago by a primordial ancestor. When it arrives in the gut, it fulfills its destiny and launches into a reproductive frenzy, eventually causing inflammation that is fatal to its host. The dying fish empties its load of parasites into the water to begin the cycle all over again. The microbiome affects fish health. Most of the C. shasta story has been discovered in the last 20 years. While the life cycle provides clues about how and where the parasite infects commercially important fish, scientists are still writing other chapters. For example, Stephen Atkinson, a research associate in Bartholomew’s lab, has found that there are several types of C. shasta. Each one infects a single species of fish. Other researchers have demonstrated that Myxozoans have an unlikely family history. Most of their distant kin live in the ocean, including jellyfish, corals and sea anemones. Bartholomew is collaborating with scientists in Israel on a project to understand the filament firing mechanism of this diverse group. One of the goals is to find a treatment for Myxozoan parasites that infect fish raised in Israeli aquaculture farms. To date, these microbes have not been shown to cause infections in humans. However, researchers have found Myxozoan infections in duck and shrews, and spores have been detected in people with compromised immune systems. Toxins from infected fish have been linked to gastroenteritis. “So now we have them in mammals and birds as well as fish. I think there’s a lot to be discovered about their diversity,” says Bartholomew. 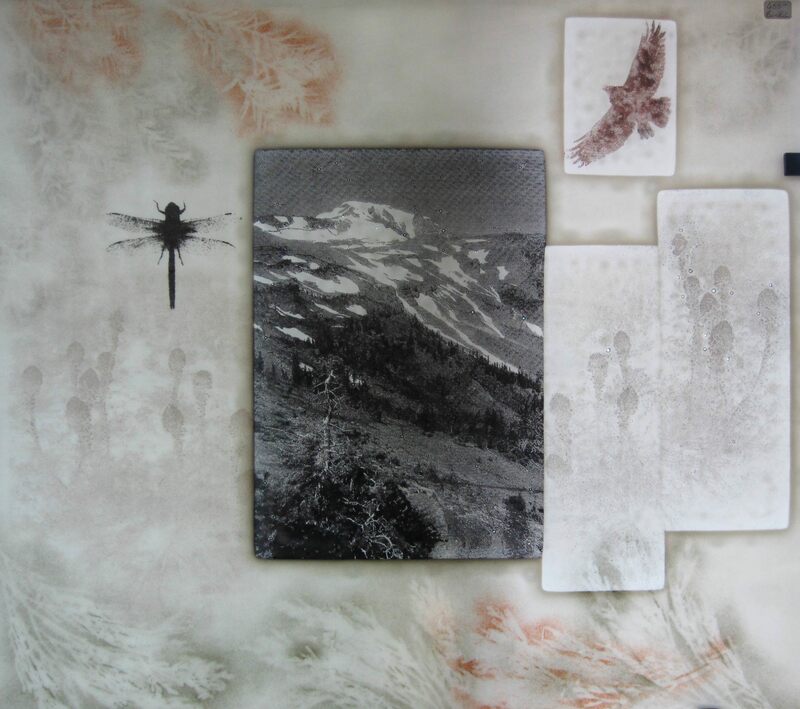 Back in her studio, Bartholomew reflects on the relationship between her science and her art. “Science is incredibly creative,” she says. “You start by thinking about what questions you should be asking, then by thinking about the experiments that could answer those questions. You often do a lot of experimenting on a small scale to test these ideas and to refine your questions before embarking on a large study. It takes persistence and technical skill to uncover the life cycle of something you can’t see with the naked eye. Nevertheless, she adds, the practice of exploring relationships through art provides fuel for the journey. “Giving myself the space to be creative in art is helpful when I approach my science. I look at science as a big puzzle. I get excited about new ideas and new techniques that we can use to think about how we can fit things together,” she adds. Detail of Mount Adams, a fused glass work by Jerri Bartholomew. “Each piece may require a different approach, so you have to be really creative about how you put them together. Once we solved the life cycle, we could start asking a whole other set of questions. You have to be creative about what these approaches are and be willing to go beyond your own discipline. You have to ask how an engineer or a hydrologist or a mathematician would approach the problem. Editor’s note: Learn more about the OSU Microbiome Initiative. Some of the steps in developing a fish vaccine show up in this fused glass work by Jerri Bartholomew. Specimen 53, Ceratonova shasta, by Jerri Bartholomew. Mount Adams, a fused glass work by Jerri Bartholomew. Living Images Yeastogram, by Johanna Rotko of Kotka, Finland.